DANBURY, CT - Five recent Western Connecticut State University Master of Fine Arts graduates, four current M.F.A. students and one undergraduate art student have been awarded Art at Ives scholarships that will enable them to display their work alongside professional artists during the third annual Art at Ives, Juried Fine Art & Crafts Show on Saturday and Sunday, June 2 and 3, at Ives Concert Park in Danbury. M.F.A. candidates who received their degrees at commencement ceremonies on May 20 and will exhibit their paintings, illustrations and mixed-media works will include Jesse Navarra, of Stormville, New York; Jennifer Oliveira-Florio, of North Haven; Jonathan Schreyer, of Monroe; Barbara Sinisi, of Wethersfield; and Alyssa Voytek, of New Milford. Current M.F.A. students who will exhibit their paintings and illustrations will include Brett Marie Colon, of West Stafford; Brian Ferreira, of Bethel; Rima Rahal, of Delmar, New York; and Andrea Rios, of New Fairfield. Undergraduate art student Daniela Pontaza-Santander, of Sandy Hook, also will exhibit her photography. The WCSU artists were selected to participate in the event after submitting an application and images of their work. Those selected received a “scholarship” in the form of a free booth to exhibit and sell their creations. All the WestConn artists will be featured together in booth numbers two through five on “Warhol Way” on the festival grounds. 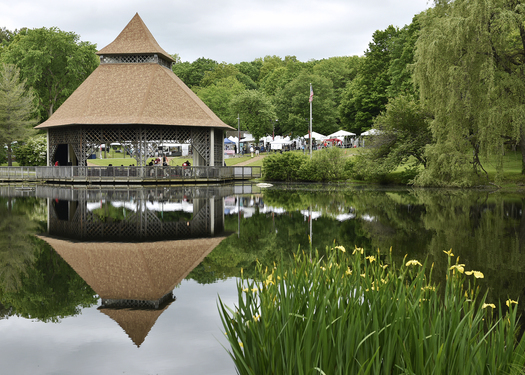 The Friends of the Ives nonprofit organization will host the show at Ives Concert Park on the WCSU Westside campus, 43 Lake Ave. Extension in Danbury. The two-day event will feature high-quality original works from more than 70 artists in a diverse scope of art forms representing every major category. Food and music, along with art demonstrations and children’s events, also will be included. New this year is a wine tasting hosted by Max Wine & Spirits and an immersive exhibit of beautiful, live butterflies. The event will take place rain or shine with gates open from 10 a.m. to 5 p.m. each day. Tickets are $5 for each day for the art show only; Wine tasting tickets are $15 in advance or $20 at the door and include admission to the art show. Children under 16 are admitted free to the art show. For tickets and information, visit www.ivesconcertpark.com.